PCOS is a condition that can affect your periods, fertility, hormones and aspects of your appearance. It can also affect your long-term health. Estimates of how many women it affects vary widely from 2 to 26 in every 100 women. This information is about the effects on your long-term health and does not cover specific treatment options for PCOS. Polycystic ovaries are slightly larger than normal ovaries and have twice the number of follicles (small cysts). Polycystic ovaries are very common affecting 20 in 100 (20%) of women. 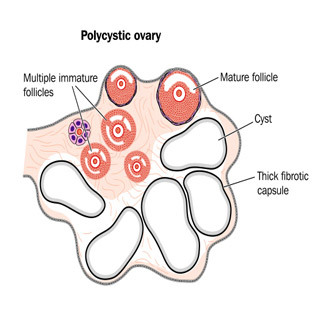 Having polycystic ovaries does not mean you have polycystic ovary syndrome. Around 6 or 7 in 100 (6–7%) of women with polycystic ovaries have PCOS. Having polycystic ovaries does not necessarily mean that you have PCOS. Women with PCOS have symptoms as well as polycystic ovaries. difficulty becoming pregnant (reduced fertility). depression and psychological problems can also result from having PCOS. The symptoms vary from woman to woman. Some women have very few mild symptoms, while others are affected more severely by a wider range of symptoms. What causes the polycystic ovary syndrome? The cause of the syndrome is not known yet, however it is often familial. If some of your relatives (mother, aunts, sisters) have been diagnosed with polycystic ovary syndrome, the risk of that the syndrome occurs to you may be increased. Testosterone is a hormone that is produced in small quantities by the ovaries in all women. Women with PCOS have slightly higher testosterone levels than the normal ones and this is related with many of the symptoms of the disorder. Insulin is a hormone that controls the levels of glucose (a type of sugar) in the blood. If you suffer from Polycystic Ovary Syndrome, your body cannot respond to insulin (this is known as insulin resistance), and thus the glucose level is higher. In its attempt to reduce the levels of glucose in the blood, the body produces even more insulin than some other body would produce. The high insulin levels can lead to the increase of body weight, irregular periods, fertility problems and higher levels of testosterone. Having polycystic ovaries does not mean you have PCOS. Women with PCOS often have symptoms that come and go, particularly if their weight goes up and down. This can make it a difficult condition to diagnose, which means it may take a while to get a diagnosis. 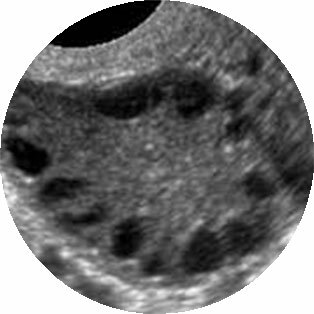 an ultrasound scan that shows polycystic ovaries. What could PCOS mean for my long-term health? If you have PCOS, you are at greater risk of developing the long-term health problems discussed below. If your blood glucose does not stay normal, this can lead to diabetes. One or two in every ten women with PCOS go on to develop diabetes at some point. If the diabetes is untreated, this can cause damage to organs in the body. are obese (a body mass index (BMI) of over 30). If you are diagnosed with diabetes, you will be given advice about your diet and may be prescribed tablets or insulin injections. Women with PCOS tend to have high blood pressure, which is likely to be related to insulin resistance and to being overweight rather than to the PCOS itself. High blood pressure can lead to heart problems and should be treated. If you have fewer than three periods a year, the lining of the womb (endometrium) can thicken and this may lead to endometrial cancer in a small number of women. There are various ways to protect the lining of the womb using the hormone progestogen. Your doctor will discuss the options with you. This may include a five-day course of progestogen tablets used every three or four months, taking a contraceptive pill or using the intrauterine contraceptive system (Mirena®). The options will depend on whether you are trying for a baby. PCOS does not increase your chance of breast or ovarian cancer. The symptoms of PCOS may affect how you see yourself and how you think others see you. It can lower your self-esteem. PCOS can lead to fatigue or sleepiness during the day. It is also associated with snoring. What can I do to reduce long-term health risks? eat a healthy balanced diet. This should include fruit and vegetables and whole foods (such as wholemeal bread, whole-grain cereals, brown rice and whole-wheat pasta), lean meat, fish and chicken. You should cut down the amount of sugar, salt and caffeine that you eat and drink. You should not drink more alcohol than is recommended (14units a week for women). take exercise regularly (30 minutes at least three times a week). Your doctor can provide you with full information on eating a healthy diet and exercise. You should aim to keep your weight to a level that is normal. BMI is the measurement of weight in relation to height and you should aim to keep your BMI between 19 and 25. If you are overweight, it would be helpful to lose weight and maintain your weight at this new level. If your BMI is more than 30, discuss ways of losing weight, including weight-reducing drugs, with your doctor. You only have to lose a small amount of weight to make a difference to your symptoms and your health. There is no strong evidence that PCOS by itself can cause you to gain weight or makes losing weight difficult. Women with PCOS over the age of 40 should be offered a blood sugar test once a year to check for signs of diabetes. If your BMI is 30 or over or you have a family history of diabetes, you may be offered testing for diabetes earlier than age 40. You can be referred to a counsellor or trained specialist if necessary. Discuss with your doctor how often you should have your blood pressure checked and whether you should have blood tests to check your cholesterol levels. If you have not had a period for a long time (over 4months) or have irregular bleeding, it is advisable to see your doctor. You may be offered a referral for further tests that may include an ultrasound scan of your womb (uterus) or treatment to make you have a period if they are very irregular. There is no cure for PCOS. 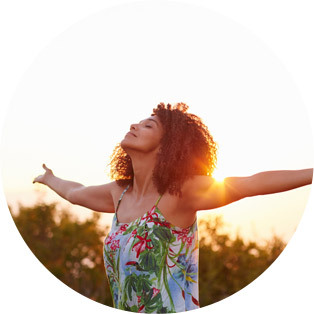 Medical treatments aim to manage and reduce the symptoms or consequences of having PCOS. Medication alone has not been shown to be any better than healthy lifestyle changes (weight loss and exercise). Many women with PCOS successfully manage their symptoms and long-term health risks without medical intervention. They do this by eating a healthy diet, exercising regularly and maintaining a healthy diet and exercise.